You’re beautiful inside and out! And you don’t need anyone to validate that for you. Picture a beautiful woman in your mind, you may think of a loved one, a friend or even a celebrity. Now think of a beautiful woman from the 80s, she’ll probably not even meet half the standards of beauty society has outlined. Wretchedly, society has set up some challenging standards of beauty. Although society’s standards will get old, the one thing that will never get old is being comfortable in your own skin. We’re living in a world where if you can’t fit into a size two then you’re not pretty at all! Beauty is what society has moulded it to be, and there’s no such thing as innate beauty. 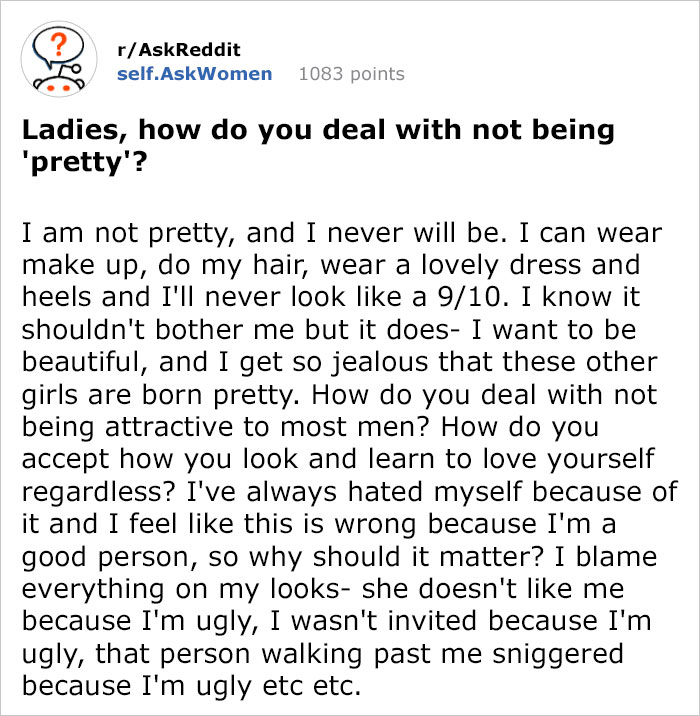 The Subreddit is a place where women can open up about their insecurities without being judged for it. An unattractive fellow woman (as she calls herself to be) was curious about how women deal with not being attractive to most men and how they accept the way they look and learn to love themselves regardless? People responded with all kinds of insight but there’s one which outshined them all, and it was from a man’s point of view. The former marine gives support whenever he can because he knows what its like to deal with negativity and body issues. But, it’s as real as death and taxes. He gets a little flutter in his chest. Whenever he looks at this woman, he feels good. To him, she is perfect and beautiful. A man in love with a woman doesn’t see her objectively. However, it’s not the same for everyone. And even with all of that, sometimes it’s not reciprocated. And some are just afraid of the person they first fell in love with. The right person will see just how beautiful you are! Let us know what you think of this in the comments below.